to live on the edge of violence! and it took a special brand of man to tame them! 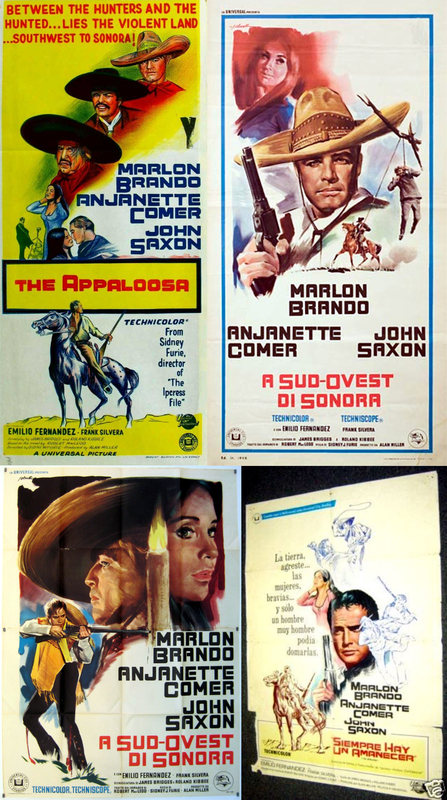 A few Western Classics mixed in with a few clunkers. But, all in all, a pretty impressive year for Westerns. 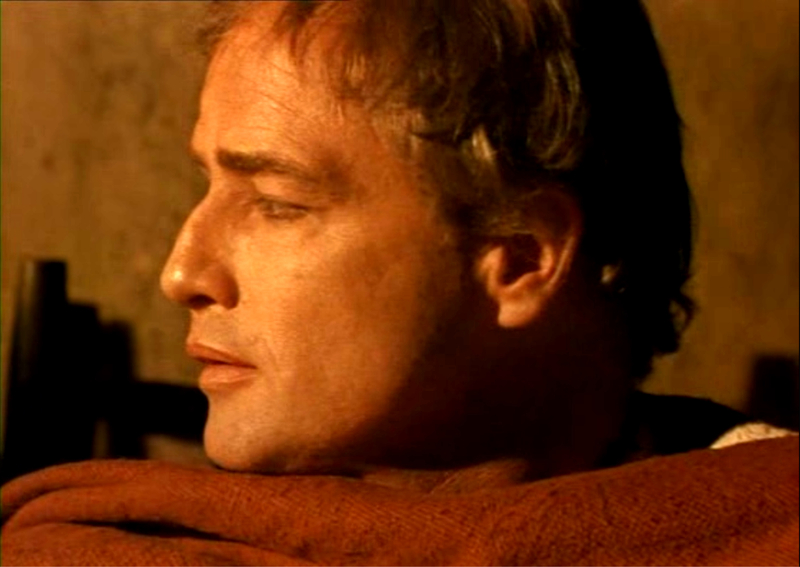 – has excellent Cinematography – and it has Brando and Saxon. 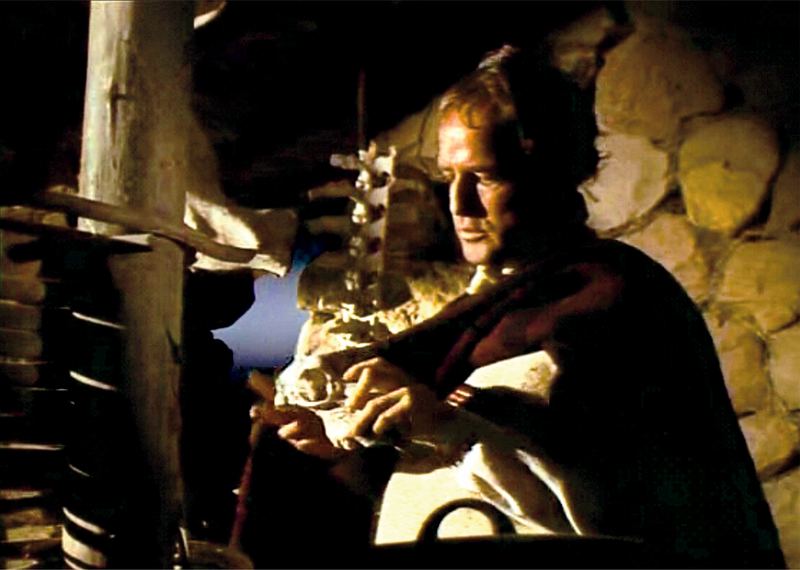 The famous scorpion arm wrestling scene with the between Saxon and Brando. I am at a loss to figure out why this movie seems to have been so overlooked? Was there a big ‘hate on’ for Brando at the time? I hope to see it eventually take it’s rightful place. Very (un)occasionally I look over My Favorite Pages (above). I don’t do this often because some of them were created years ago now – and they’re awful. Then I’m forced to fix ’em up. Back then I didn’t know how to operate WordPress very well – or edit images – and a few dozen other things. I’m no genius now, but I’ve gotten better. 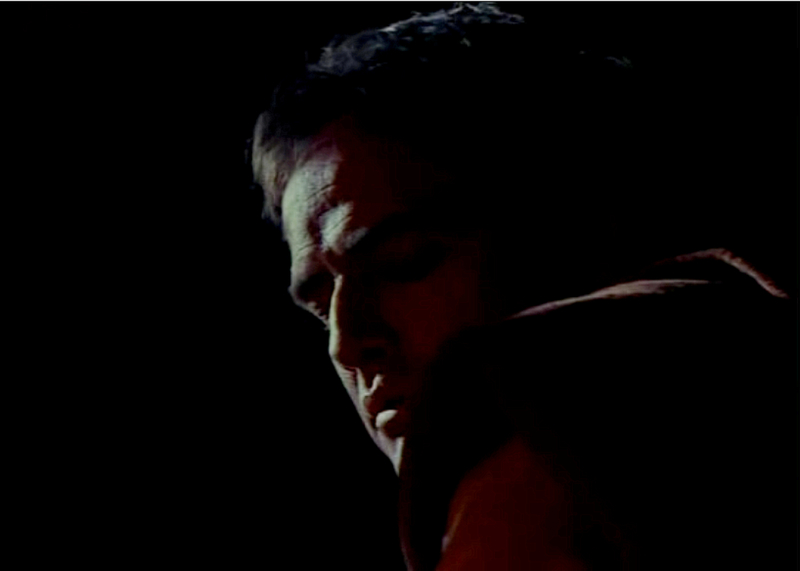 Such is the case of The Appoloosa (1966) starring Marlon Brando. My Page was awful. I consider this a great Western so it deserves much better treatment. Therefore, I’ve now beefed the Page up – included a bunch of stuff from my other posts and so on. Some images should still be re-worked, but t’s almost worth a look now. 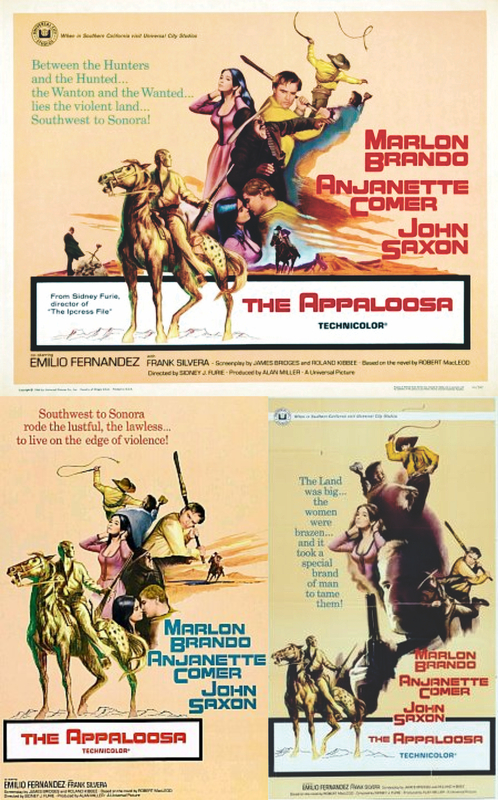 The Appoloosa really is a great Western with several excellent scenes – some Classic. This scene has a couple of stunning qualities. The first quality is that it has NO music. Did you notice that? It’s very rare for any film maker to exclude music from any scene of impact. But it works well here. 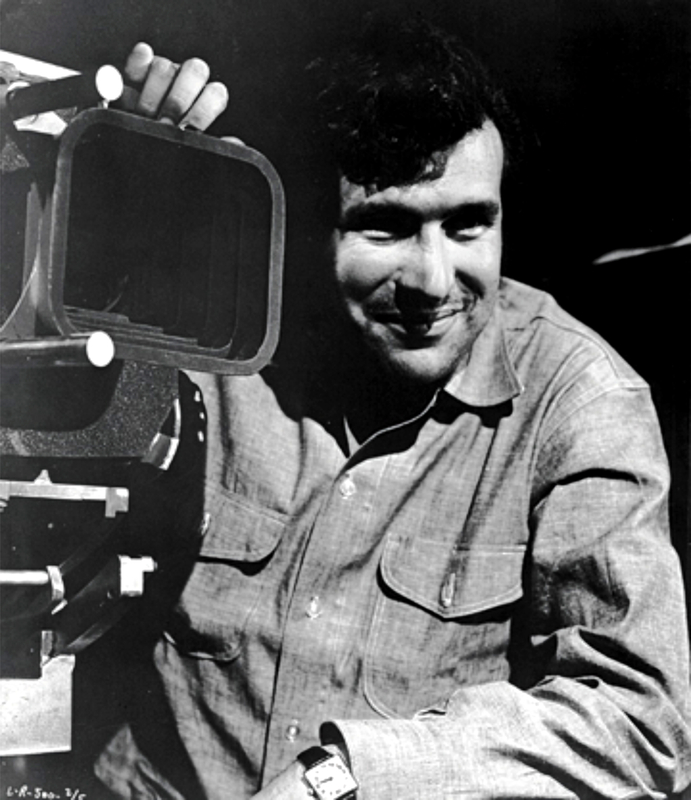 The other thing is Director Sydney Furie’s superb use of close up shots – something he employed to great effect throughout the film. 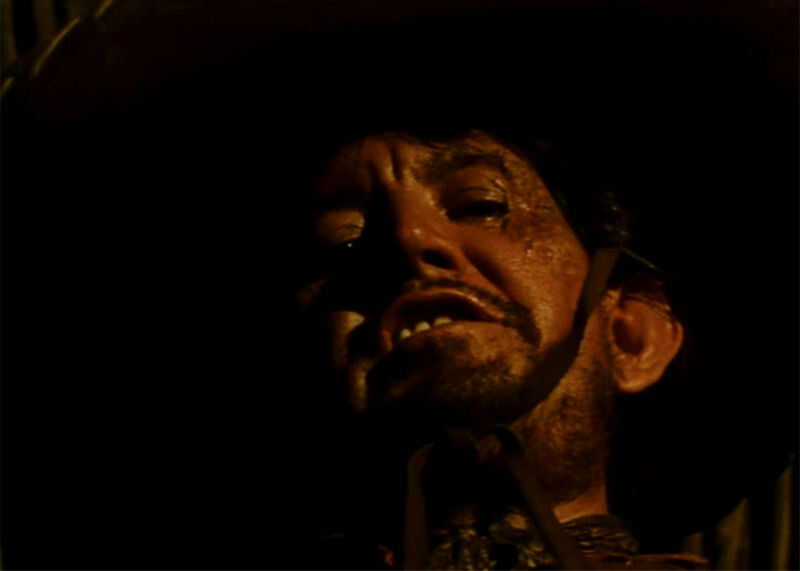 Furie lets the setting, the lighting, the composition, the dialogue, the Actors, and the close-ups deliver the impact. 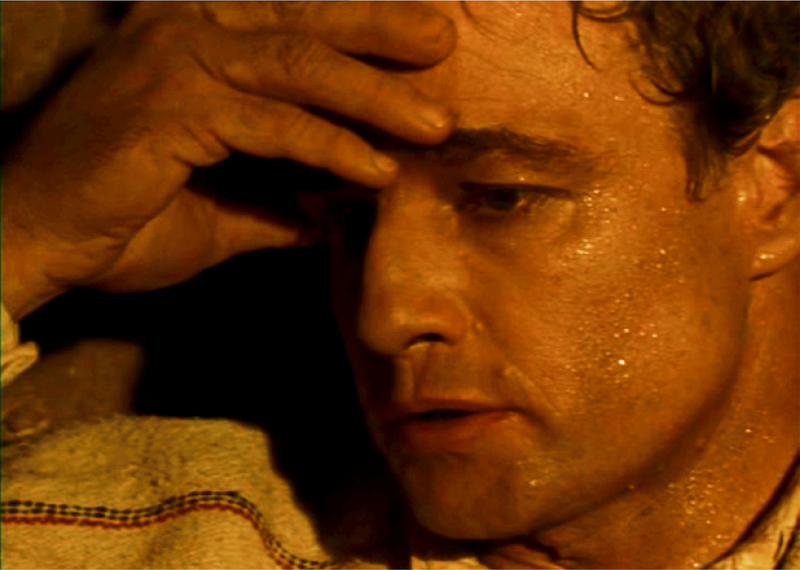 The effect is one of the greatest scenes in Western Movie history. 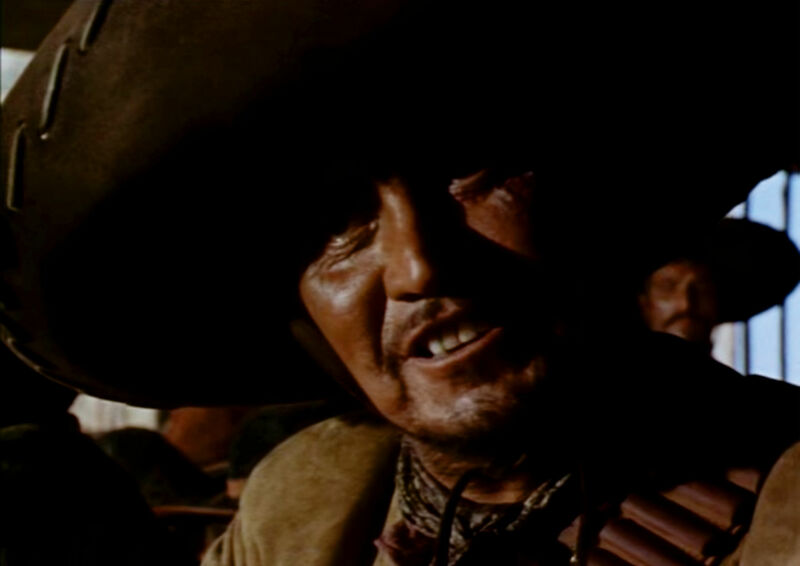 Director Sergio Leone didn’t invent Close-Up shots, but he certainly was influential in their use. 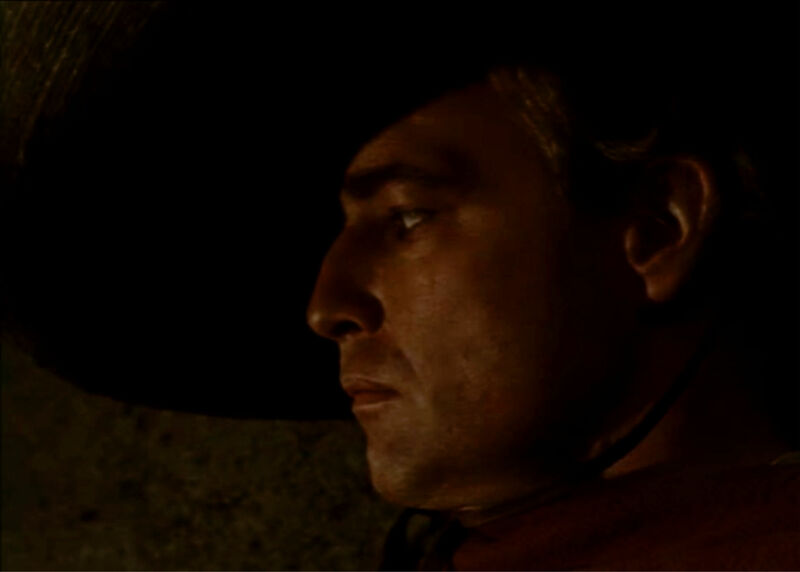 This is partly why The Appaloosa is often referred to as the “American Spaghetti Western” – as Director Sidney J. Furie uses close-ups extensively. 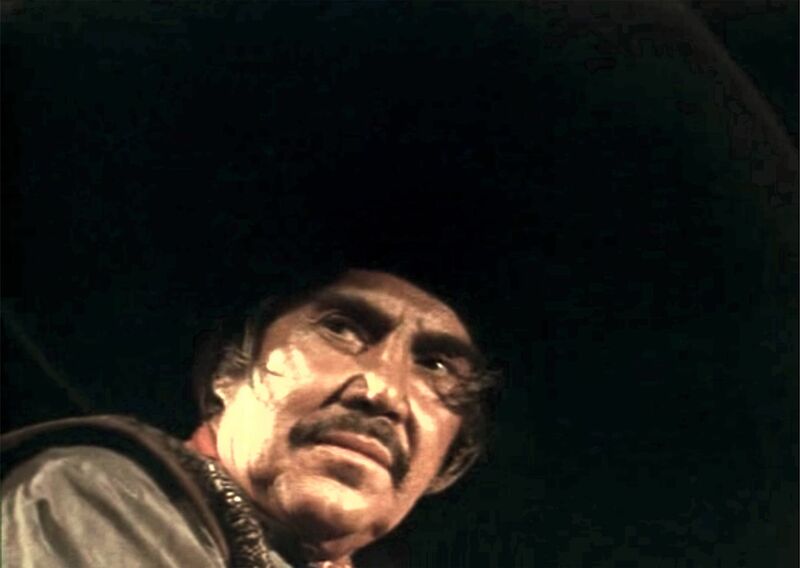 The movie was also made during the height of Spaghetti Western popularity (1966) and has more than it’s share of Mexican banditos. 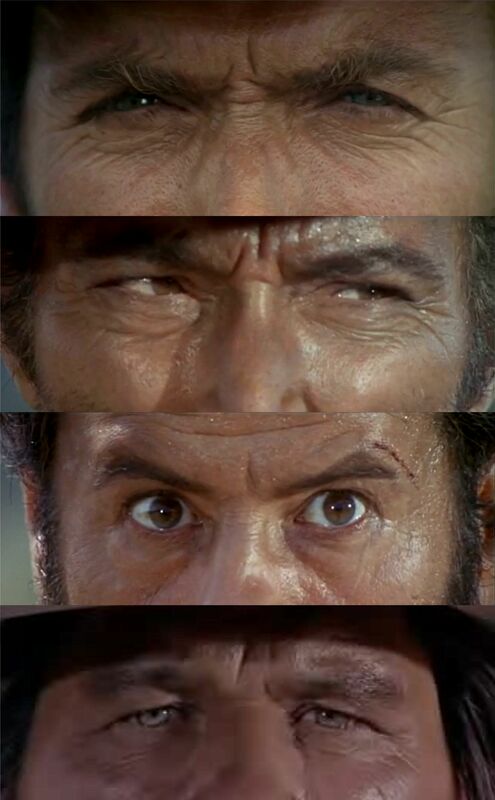 Leone’s Eyes … guess who ? Furie loves and knows how to use effective closeup shots. … these are not your friends. 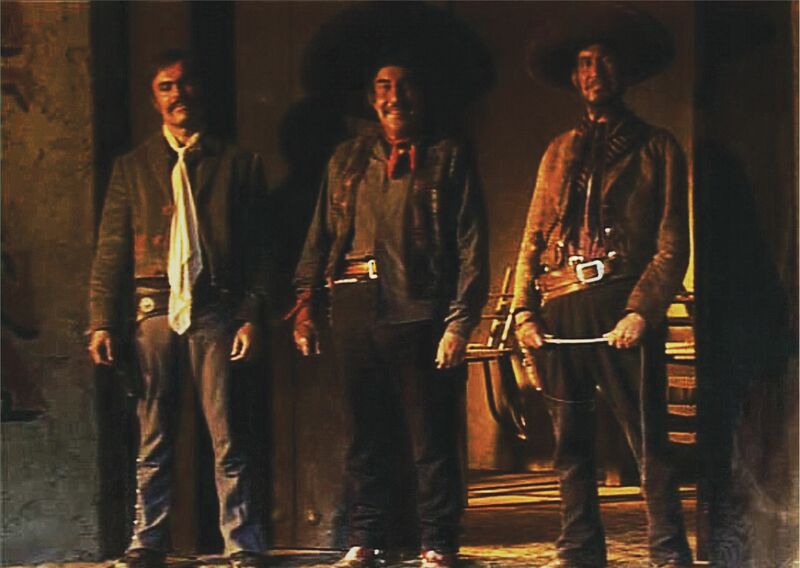 in a small Mexican cantina – obviously frequented by Mexican banditos (aren’t they all?). 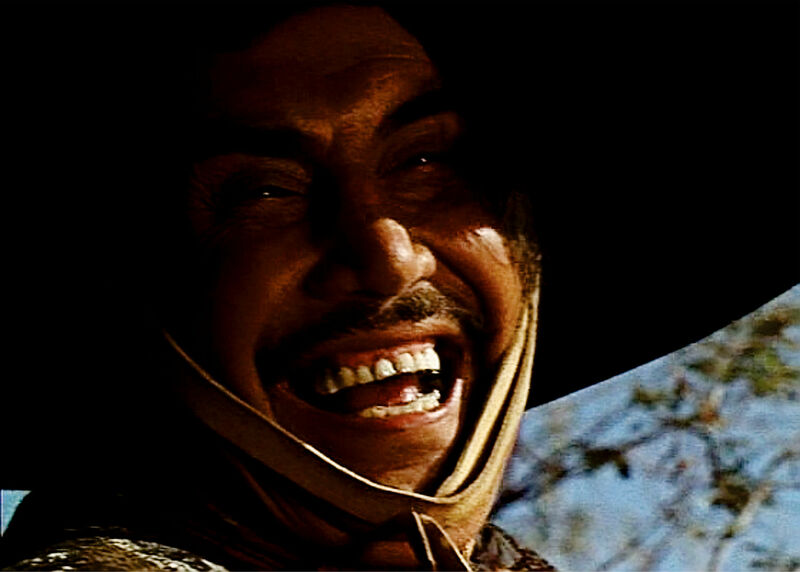 MFW: Pulque – in it’s several variations is actually said to have some medicinal qualities – with or without flies. 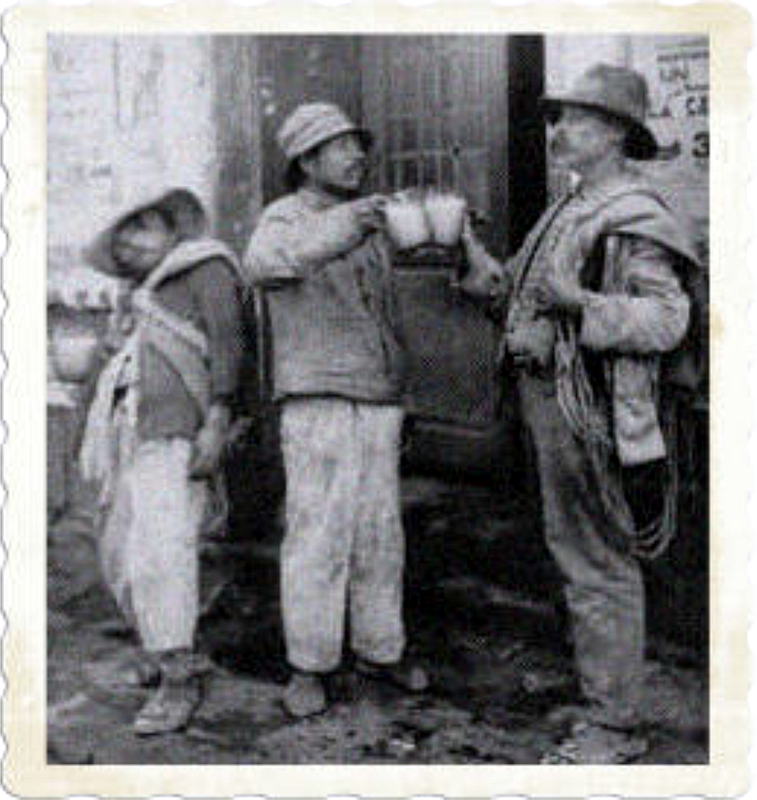 “Pulque is like beer – it has a low alcohol content, about 4-8%, but also contains vegetable proteins, carbohydrates and vitamins, so it also acts as a nutritional supplement in many communities. – the movie is not really about the horse. But I still wish they had shown him more. Truly a beautiful animal. The pony in the movie was named Rojo. Curiously enough, the recent film Appaloosa (2008) starring Ed Harris and Viggo Mortensen also has nothing to do with a horse either. One wonders if the title isn’t a nod to The Appaloosa. 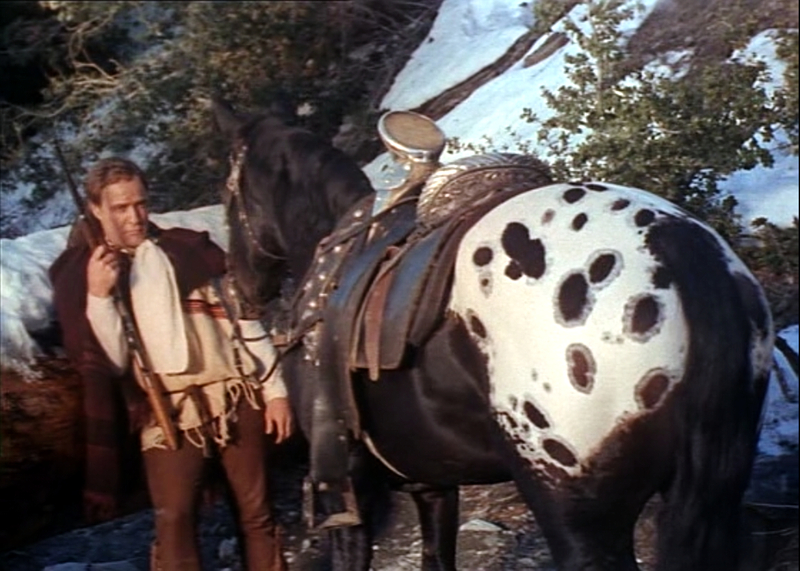 Brando with the Appaloosa – alas, one of the few good images in the movie. 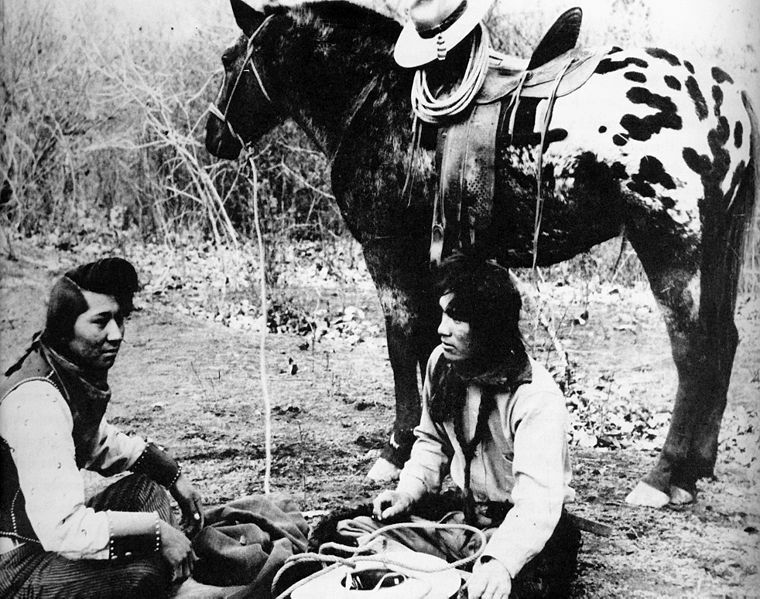 The history of the Appaloosa Horse breed is much too involved to put here, but the Nez Perce Indians were responsible for the North American breed. I remember watching this on TV as a kid. The arm wrestling match with the scorpions really impressed me then because it was something different and not like the standard westerns I was used to seeing. Looking back, it seemed to have almost a Spaghetti Western feel to it. 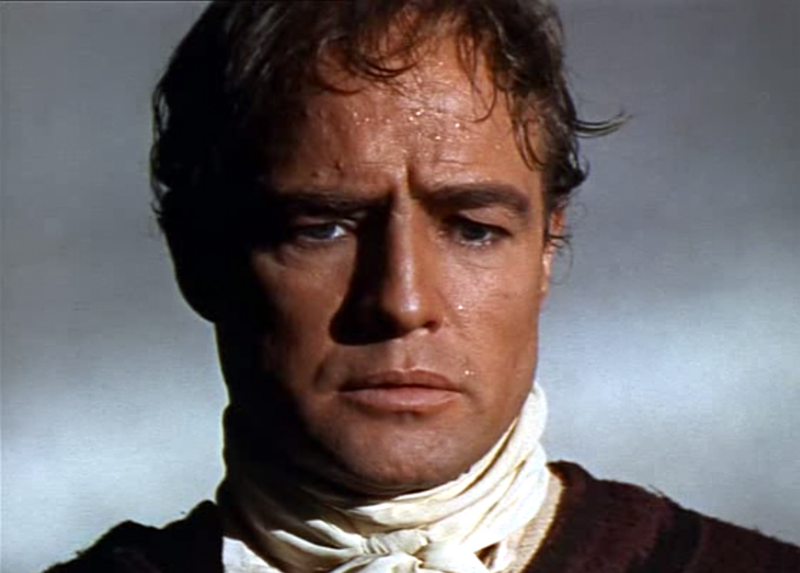 What can you say about Brando that has not already been said? 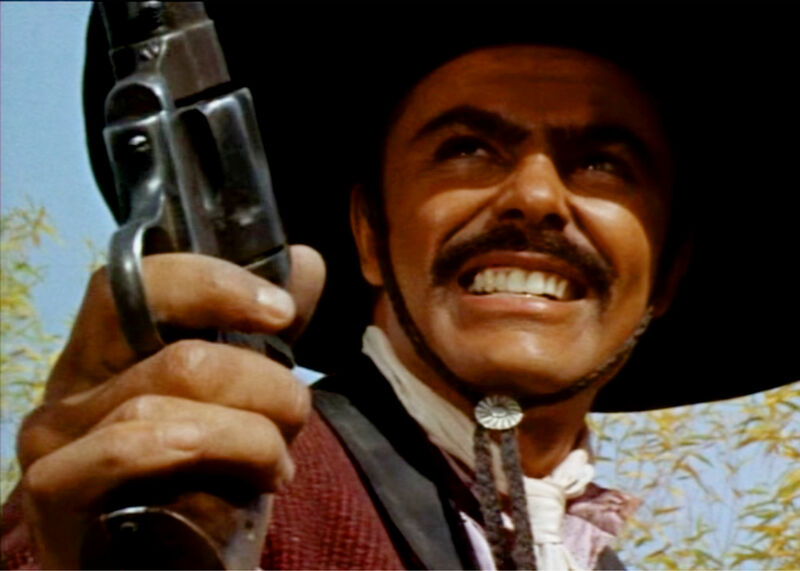 I think John Saxon is good in westerns as well and am surprised he didn’t become a bigger star than he did. 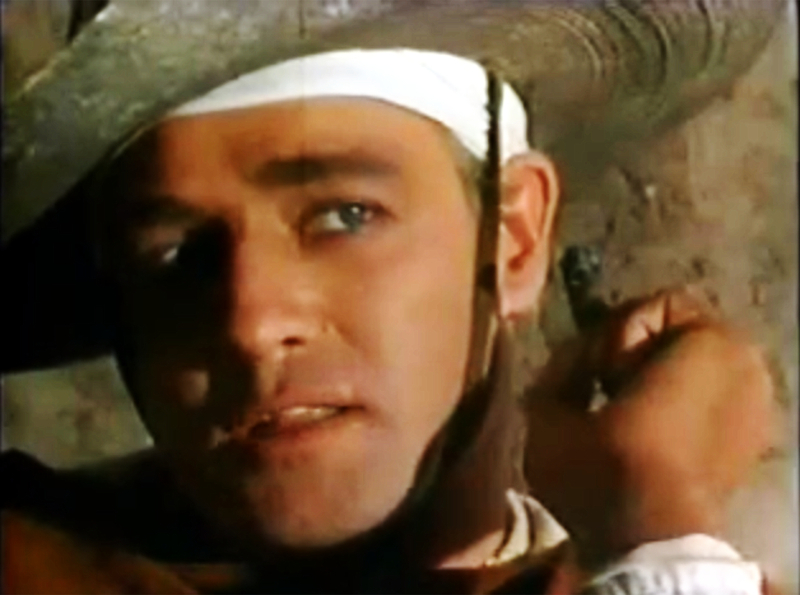 I liked him in Joe Kidd as well as many other movies of all genres. 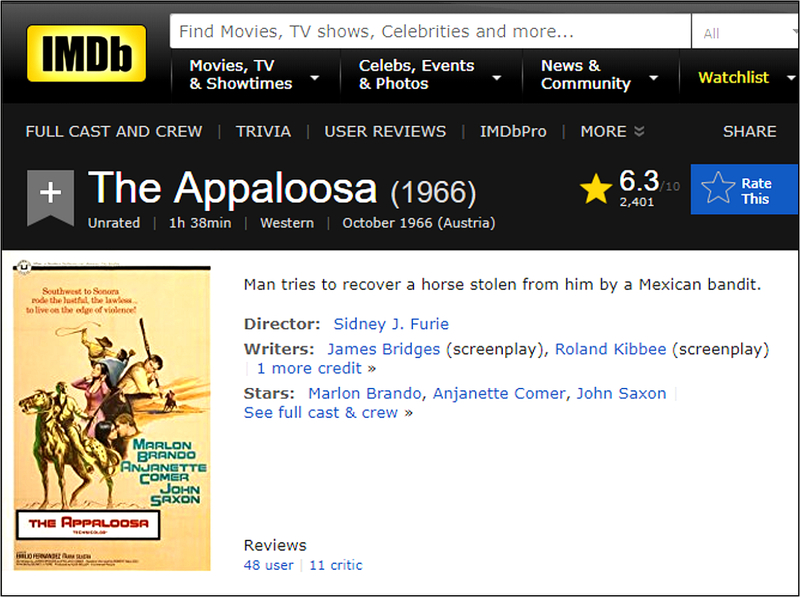 I recently watched ‘Appaloosa’ from 2008 , which has nothing to do with this movie despite the similar title. I was a little put off at first at what I considered stealing the title of a remembered favorite. In spite of that the movie really pulled me in and I really enjoyed it. 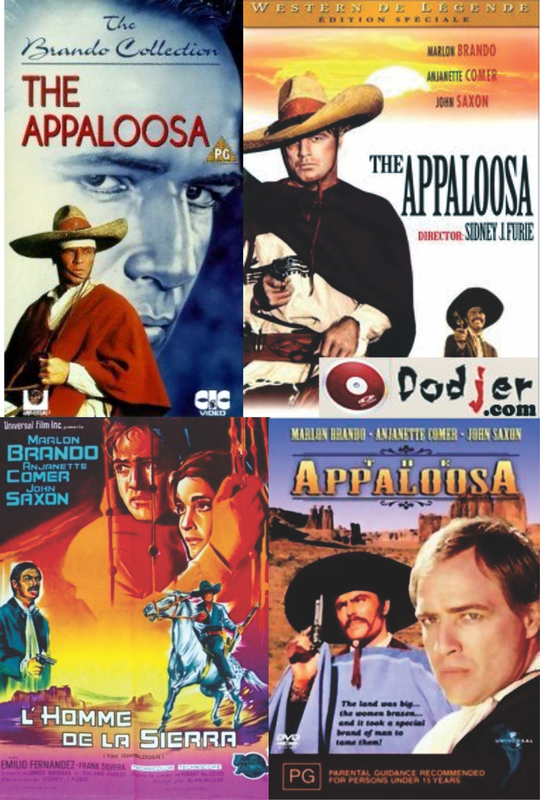 In this case, Appaloosa was the name of a town that hired professional lawman Ed Harris and his deputy Viggo Mortensen to tame the lawless element in their town. Harris and Mortensen have a special chemistry between them and both are totally badass in this. 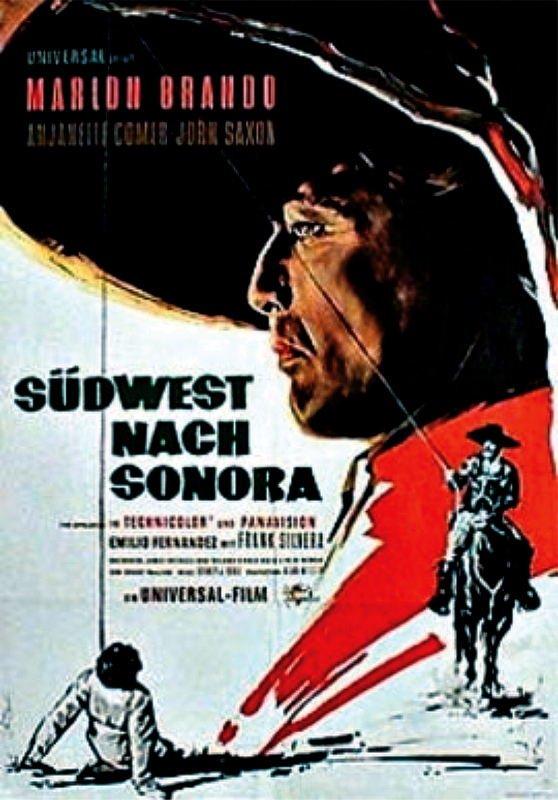 Despite being a newer Western, it is done in the old classic western style. I highly recommend it to any true Western fan. To me, Renee Zelwegger seems to be awkwardly inserted and takes up quite a bit of time. I like Renee, but not sure she adds to things here? Otherwise. 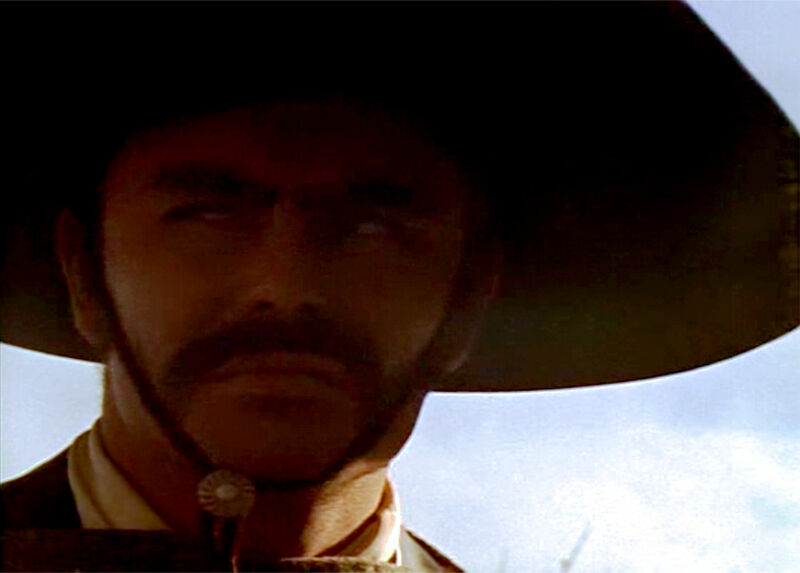 as you say, a pretty good straight up Western – badguys vs goodguys. Vito, Irons, and Harris – always good. Need to watch it again and see if looks different. Loved that scene – unique and beautifully set up. Another great cast – Saxon was perfect in his part. Good story. Now that you brought that to my attention, Zelwegger really didn’t do much of anything, did she? At first, it seemed to be setting up a love triangle, or Harris losing it in a jealous rage and going on a shooting spree. Neither one ever happened. He just seemed to meekly accept the fact she was a tramp, but he was determined to stay devoted to her and ignore her ways, even when they made it appear she was sneaking around and seeing his main enemy, Irons. They just kind of dropped it and nothing ever came of it except it prompted Viggo to shoot Irons and break up the partnership with his old friend. Harris took no crap from anyone except her. I guess she was just there for that purpose, but like you said, she took up a lot of time and added very little.